green tea: Get off the sidewalk! Oh, this is so necessary! Thank you, Internet Slacker! It isn't one of the listed offences but what makes me craziest is when pedestrians travel in dawdling rows of 3 to 5 people, effectively blocking faster traffic behind them as well as all oncoming traffic. 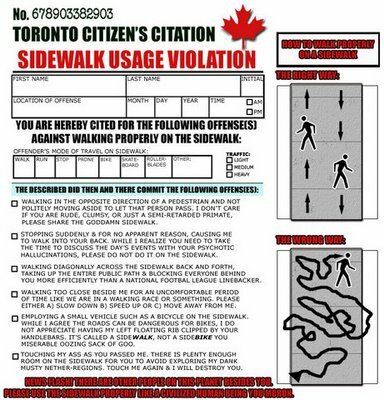 This seems to be particularly prevalent in my neighbourhood where everyone is out for a carefree stroll on the way to and from the many bars and restaurants. The worst are the droves of young women with more make-up than brains who form impassable human barricades as they move along the sidewalk at a snail's pace. Is this a pick-up technique? A big, slow-moving pack of ladies is more likely to catch the attention of the menfolk? You live in Little Italy...Italians only move fast in Ferrari's! My pet peeve is people running/jogging on busy streets. F*#@ off already! We can see you exercising, Bravo... now go do it somewhere less congested! !